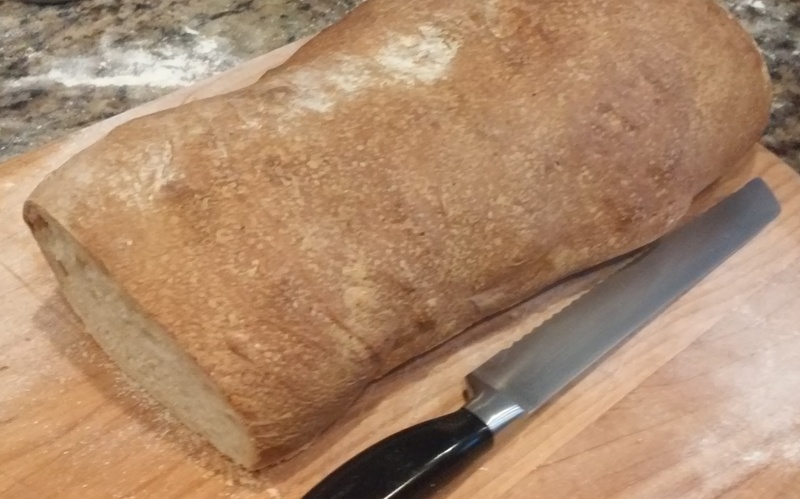 Ciabatta is a rustic bread with a crispy crust, a chewy texture inside with large shiny holes. It is served in Gourmet Restaurant across the country and is the bread of choice for Panini Sandwiches. Ciabatta is native to Italy. To make the Poolish, place Cool Water in a medium bowl; add 1/8 tsp. Yeast. Stir in 2 1/3 cups Flour until well-mixed. Cover and let stand at room temperature 10 –12 hours or until mixture is doubled in size, light and foamy with large bubbles. Place the 4 ½ cups Flour in a large bowl; add Salt and 5/8 tsp. Yeast. In a medium bowl, whisk together the Warm Water and Olive Oil; add to the Flour Mixture along with the Poolish. With hands or dough whisk, mix Dough until all the ingredients are incorporated. Scrape sides of bowl clean, cover and let stand 20 minutes. Turn dough out onto floured surface; pat with palms of hands to flatten slightly. Fold side of dough nearest you to center, stretching dough as you fold, stretch and fold dough opposite you to center. Stretch and fold right side of dough to center, repeat with left side. Lightly dust owl with flour, place dough, seam side down in bowl. Cover and let stand 20 minutes. Repeat the above process four more times, then allow to stand, covered 50 minutes. For a shortcut version, skip step 9 and allow dough to rest 50 minutes after step 8. Lightly spray a baking sheet, then dust with a mixture of ½ flour and ½ cornmeal (about ¼ cup each). Gently place the dough on a floured surface, being careful not to deflate it. Lightly flour the top of dough. With palms of hands, pat dough into 10-inch square about 1 inch thick. Let stand 2-3 minutes to relax. Cut dough into 3 equal strips, then cut each strip into 3-4 inch pieces. Gently place each strip on prepared baking sheets, about 2 inches apart. Cover dough with towel and let stand 45 minutes. Adjust oven racks to bottom and center positions; place a pan of water on bottom rack and turn oven to 450 degrees. After dough as risen lightly dust with more of the cornmeal, flour mixture, place in oven and spray tops of rolls with water from a spray bottle. Bake for about 20 – 25 minutes or until golden brown and the bottom sounds hollow when tapped. Cool on wire cooling rack. As an alternative, the Dough may be formed into a loaf instead of the rolls. Just omit step 14.